We are pleased to report a happy ending to a potentially dire story featured here recently. 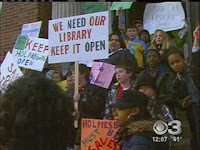 In an encouraging development for threatened urban public libraries, the Pennsylvania State Senate voted to pass a bill which allows the Free Library of Philadelphia to remain open. Passed on September 17, 2009, Senate Bill 1828 allows the City of Philadelphia to avoid the "Doomsday" Plan C budget scenario, which would have resulted in the layoff of 3,000 city employees and forced the closing of all libraries. According to the Free Library's blog, more than 2,000 letters were received by state legislators, along with countless calls and emails underscoring the importance of public libraries to the community. The legislation passed by a vote of 32 to 17, and provides monies to keep all 54 branches in the system open. The public library is likewise a key supporting a state's social, economic, cultural, and educational life. Pennsylvania, the home of the Liberty Bell and the birthplace of the US Constitution, the Declaration of Independence, and the Gettysburg Address, also boasts a citizenry strong enough to support the foundations of democracy: freedom of expression, freedom of speech, freedom of assembly and the right to read.